MEXICO CITY (AP) — Mexico’s newly inaugurated president kicked off his first Monday in office with something not seen in recent history — a news conference and a pledge to hold one every working day of his six-year term to keep the people informed. 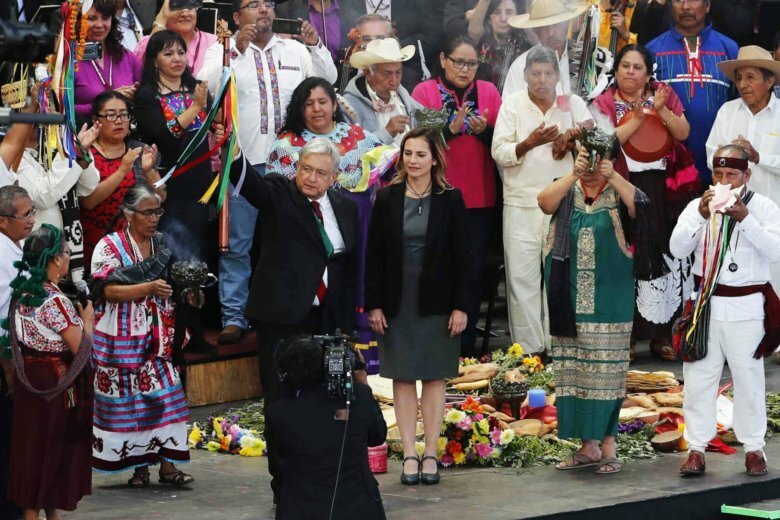 Two days after taking the oath as the first leftist president in decades of technocrats, Andres Manuel Lopez Obrador made good on his promise to govern as a common man and end decades of secrecy, heavy security and luxury enjoyed by past presidents. His workday began at 7 a.m. with a gathering of more than 100 reporters, photographers and TV cameramen all trained on the new leader, his gray hair slightly ruffled as he answered questions. “Isn’t that a change that I am here, informing you?” Lopez Obrador asked. While past presidents have rarely held news conferences, Lopez Obrador promised to do so on a near-daily basis, much as he did when he was mayor of Mexico City from 2000-2005. “He didn’t hit the ground running, he hit the ground flying,” said Federico Estevez, a political science professor at the Autonomous Technological Institute of Mexico, who was impressed by the president’s ability to improvise and speak for hours on end without using a teleprompter. On Monday, Lopez Obrador tackled a case that cast a long shadow over the previous government, signing a presidential decree creating a truth commission to investigate the 2014 disappearance of 43 students in an apparent massacre. He then posed with parents of the missing young people, who displayed photos of their loved ones. Prosecutors have said the students from a teachers college in southern Guerrero state were killed by a drug gang and their bodies incinerated in a massive fire. But conclusive evidence has never been found or presented, leading the students’ parents on a frustrating, painful four-year quest for the truth. Earlier, the new president arrived at Mexico City’s National Palace in the same white Volkswagen Jetta compact car he used before taking office Saturday. He has refused the military bodyguards used by past presidents and travels with a small staff of aides who provide security. He usually travels economy class. At 65, he is the oldest president in the last half-century — six of his eight predecessors were in their 40s when they took office — and he has displayed impressive stamina. Following a lengthy inauguration address on Saturday, he spent more than an hour and a half speaking in Mexico City’s main square, talking about government programs in granular detail: how concrete for roads would be mixed to maximize the use of local labor, and which animal and tree species would be best for agriculture and reforestation programs. Lopez Obrador took his first flight as president Sunday, boarding a commercial airliner with the rest of the passengers on his way to the Gulf coast state of Veracruz for a rally. He has promised to sell the presidential jet as an austerity measure, and the plane departed Monday to a California air service facility, presumably to be sold. During Monday’s news conference, Lopez Obrador claimed that the number of murders had declined during his first two days in office. In the first 10 months of 2018, homicides in Mexico have run at an average of over 80 per day, and Lopez Obrador said the average over the weekend was about 50, though he noted the figures were preliminary. He did not offer any explanation for why homicides would have fallen. Late in the day, officials in the western state of Jalisco reported that a band of gunmen killed six police officers Monday during an attack apparently aimed at freeing a prisoner. Jalisco Attorney General Marisela Gomez Cobos said one attacker was wounded and in custody, but the others escaped in three vehicles. Lopez Obrador also said the necessary work would continue to complete the foundations of a partly built Mexico City airport project he plans to cancel in favor of expanding existing airports. Officials did not say what will be done with the vast airport foundations being built on a former lake bed known as Texcoco. But further work is needed to keep the slabs from decaying or sinking. Lopez Obrador has promised to protect investors who bought bonds to fund the construction, but on Monday the airport fund issued an auction offer to pay off $1.8 billion of $6 billion worth of outstanding bonds at a price as low as 90 cents on the dollar, suggesting some bondholders may take a haircut, though the price still has to be determined. Financial markets remained on the fence, with some uncertain about how Lopez Obrador will live up to his promises to balance budgets while expanding scholarships, pensions and other benefits. “The messages so far have not eliminated the uncertainty about what may happen under Lopez Obrador’s administration, but they haven’t worsened it,” Mexico-based CIBanco said in a statement.